Preheat your oven to 375 degrees F. Lightly spray mini muffin pans with baking spray or use silicone muffin pan. Lightly dust a work surface with flour. Working with half of the dough at time, roll your crescent roll dough out onto a large cutting work surface. Using a knife or a pizza slicer , cut the dough into 6 roughly even squares, don’t worry if they’re not perfect…mine certainly didn’t, but in the end turned out just fine. Place each of the dough squares into a mini muffin pan as shown on the picture above. Fill each cup well all the way to the top with apple pie mixture and set aside while preparing the streusel. Combine - 1/3 cup of sugar, 1/3 cup of flour, 1 teaspoon of cinnamon, 1/2 tablespoon of water and 3 tablespoons of softened butter. Use a fork to mix the butter into the mixture until it becomes crumbly. Now you sprinkle some over the apple pie filling in each cup. Bake Bites for 20 minutes, until tops are golden and a toothpick comes out clean. Leave the bites in the pan for 10 to 15 minutes, then transfer to a wire rack to continue cooling. The bites can be stored in an airtight container for up to three days. I can’t tell from the picture but can you use a regular 12 cup cupcake pan? or does it have to be the mini mini one? 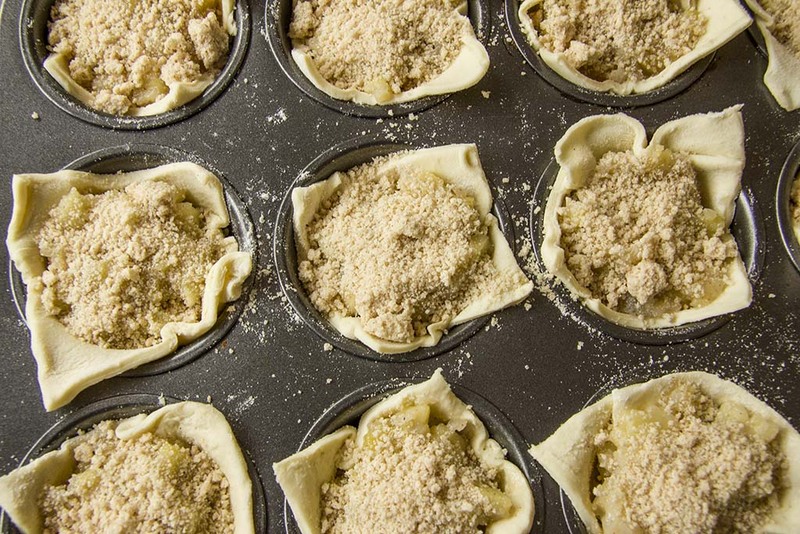 These Apple pie bites are made in standard 12 cup muffin tins! I’m sorry for the late response and I hope your muffin turned out well ! Just want to be sure which pan to use. Is it mini or not? Directions say mini and you cant tell from the picture? Hi Amy,yes it is 12-Cup Mini Muffin Pan.Happy baking! you should fix the recipe. It states mini muffin pan in step one. Which I used and it did not turn out well. Also in the ingredients list it states melted butter for the streusel. But in step 5 it says softened. I cannot find the page that allows me to print the entire recipe for Apple Pie Bites with Cinnamon Strussel. I can only see the recipe for Easy Homemade Apple Pie Filling. Looks absolutely delicious, but how do I print out a copy of the recipe? 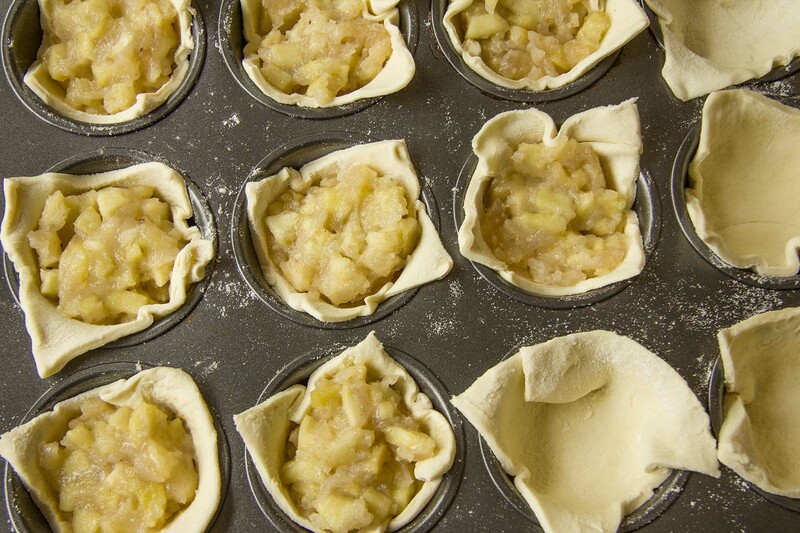 Just make apple tarts using same ingredient. Only thing I did differently was I place an apple slice out of the pie filling in the crescent roll and rolled it up with a pat of butter on top and a sprinkle of brown sugar and cinnamon. They were great! So excited this showed up on our feed today! Can’t wait to give it a go. Thanks for sharing the recipe!